Last night we celebrated opening night of CAAMFest, an 11-day food, music and film festival organized by the Center For Asian American Media (CAAM), that takes place in San Francisco and Berkeley, California. CAAMFest is a special festival for me because it’s where I first discovered the potential of a festival to change peoples’ lives. 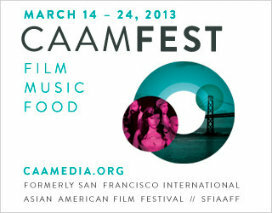 I’ve been developing the CAAMFest website (which was formerly known as the San Francisco International Asian American Film Festival) every year since 2006, first as a young freelance web developer, and more recently as the principal developer and founder of Gala. In 2006, after working hard for months on building CAAM’s festival site, and being continually intrigued by the site’s film content that I was compiling into the site, I was rewarded with tickets to see many of the films. It was the first festival that I’d ever attended, and honestly, it changed my life. As a 23-year-old transplant to San Francisco who spent most of her life growing up in a small town in Maine, and who’d never lived in a city before, the festival opened my eyes and my mind to myriad new ideas and experiences. The festival took me to the fantasy world of a sardine factory worker in Thailand, enabled me to deeply and personally relate to college students in Tiananmen Square-era communist China, and learn about the history of Asian American men on the big screen, to name just a few among many other transformational impressions I had. At the closing night film, I had an especially powerful experience watching a drama about the Vietnamese refugee experience after the Vietnam war. For the first time, I learned about conditions in communist Vietnamese “reeducation” camps, refugees braving death to escape those camps, travelling by boat for weeks while being continually attacked by pirates, and the subsequent immigrant experience in California, with all of its difficulties. The film moved me to tears. Once the film concluded, the moderator asked if there was anyone in the audience who had escaped from a reeducation camp in Vietnam. A fair number of people in the audience stood to their feet. For several minutes afterwards the room was filled with applause in recognition of their experience, which we had just collectively witnessed in the film. At that point, I’d been trying to recover from the emotions I had felt while watching the film, but after looking around and seeing so many of my fellow audience members standing, I was in disbelief, and felt even more moved than I thought was possible. I had become acutely aware of the richness of life experiences of my fellow citizens. The festival had brought a packed audience to this screening, along with a moderator who was able to ask the right questions after the film. Among other things, this provided hundreds of people with opportunities to transform which they wouldn’t have had otherwise. Many of us learned about the experiences of our fellow citizens, and others were provided with a forum for their experiences to be recognized by their fellow citizens. The result was that I gained a new perspective on, and a new respect for those in my city, and many around the world, simply by having attended the festival. In the years since this life changing experience, I’ve cried at lots of films curated by festivals, danced and partied at concerts put on by festivals, and attended discussions on topics ranging from the use of technology in audience building, to the role of religion in horror films. Sharing these experiences with people who were either experts or newcomers, made the experience so much richer. I felt more connected to the city I had moved to, and subsequently transitioned from being a transplant to an engaged citizen of the city where I lived. This is the potential of a festival. I’ve also reflected on the fairs and festivals I attended in my community as a child, and realized how important these were to my understanding of the community I lived in, and my own identity. After a few years building CAAM’s festival site, I realized that it was the work I looked forward to and enjoyed doing the most each year, and that it was what I’d rather be doing all year. I also realized that as a web developer, the best way I can contribute to promoting festival experiences in communities around the world is by improving their online presence, which can be used to both generate interest, and provide access to attendance to as many people as possible. With this vision in mind, I started building Gala in 2011. It was released to the public a few months ago. I hope that as we grow as a company, we’ll be in some way responsible for getting more folks out to festivals, and hopefully at least a few more can have their own life-changing experience, in whatever way serves them best. ← Version 2.0 has arrived!